As Neopia rapidly approaches the Year 8, that time of year has come again; the time of year when Neopians from Happy Valley to Mystery Island will be considering their aims and goals for the next year. It is that time of year when the dreaded, the feared, and the oh-so-hard-to-stick-to New Year's Resolutions are made. There is an art, however, to creating an achievable aim. It is not advisable to create something so unrealistic that you will never achieve it- you must be truthful as to what is and what isn’t possible. Whether you are just considering that perhaps you ought to make one (trust me, you should!) or whether you are a seasoned resolution-maker checking for any new tips, this guide is for you! The following list contains 12 suggestions for the perfect New Year's Resolution for any Neopian, and a brief comment on the practicalities of each. Happy reading! 1) This year, I will earn the _______ avatar! Avatars, the Neopian craze. No one has every single avatar possible, and I’m sure there’s one out there you’d just love to have! Work hard, practice long, save up, I’m sure with a little determination you’ll get it! Downside: Although ambition is good, try to keep realistic. If you set yourself a goal to get an extremely rare avatar, such as the Super Attack Pea, this might not be achievable. The key to a good resolution is that it’s achievable, so you can feel awesome when you’ve achieved it! 2) This year, I will make and complete a gallery with a _______ theme! Yay for galleries! If you’ve never made one, you should, they’re such fun. Do you have a secret craze for meepits? An obsession with shiny things perhaps? (oooooh, shiny) Why not devote a gallery to your interest, and perhaps win the gallery spotlight! Downside:... is there a downside? 3) This year, I am going to save up ______ neopoints! In order to buy yourself anything nice on neopets, you need to earn neopoints in some form. If you play games, or if you restock, or if you do both, you might always find yourself wishing that you had more neopoints. Why not save up to a certain amount, and afterwards have a giant shopping spree! Practicality: Try to keep the amount within your reach. It won’t be a very fun resolution if it takes you until the very end of the year to reach. Don’t make it too little either, however; the more you save up, the bigger the shopping spree you can have afterwards!! 4) This year, I am going to buy myself a ________! This sort of ties in with resolution #3. I’d be willing to bet there’s at least one item that you *really* want, but have never gotten around to buying. Maybe you asked for it for Christmas, but you didn’t get it, for whatever reason. It might be expensive, or rare, but if you put your mind to it, you’ll be able to get it in no time! Practicality: Watch out for the Pant Devil; he has a tendency to steal those items of which you are most proud- defend yourself! 5) This year, I am going to get an article/story/series/comic accepted in the Neopian Times! Who would not like to be eligible to claim the fame of being published in Neopia’s fill in the blank news source? And get a pretty trophy, too (shiny ^_^). Work hard, and try to be as original as possible, and pretty soon you’ll be up there with the stars! Practicality: If you can’t write/draw (in the case of a comic) this might prove a little difficult. But hey, it could be your resolution to learn! 6) This year, I am going to get accepted into the Art Gallery! Ahh, the art gallery, the gathering of Neopia’s most elite artists. Persistence and practice will pay off, and pretty soon it might be your masterpieces filling those pages! Practicality: None really- some people are talented artists from the start, but others can learn to be. Art can be anything you want it to be! 7) This year, I am going to paint my neopet _____! This is a great one, I bet your neopet would absolutely love to have a makeover! Even if it takes you a while to save up for that long-dreamed-of pet, it will totally be worth it! Practicality: If you find earning neopoints difficult, perhaps you should aim for one of the less expensive paintbrushes- that way your resolution will be much more realistic for you. 8) This year, I am going to learn how to make myself a lookup! Now matter how talented someone is, they will never be able to make you a lookup so completely to your tastes as one you make yourself. Why not take a little time each week to start learning CSS? Even with just MSPaint, you can do some really pretty things. You’ll be heading up the Userlookup Spotlight before you know it! Practicality: CSS can be daunting at first, and you might be quite put-off, but stick with it! Once you understand the basics, it becomes very simple. 9) This year, I will decorate my neohome! Your neohome is a very important place, as I’m sure you already realise. If you have been neglecting it (tsk tsk!) then perhaps now is the time to start anew. There is so much beautiful furniture around Neopia that you could buy! Not to mention the amazing things you could do with your garden. For inspiration, check out the neohome spotlight. Practicality: Furniture and extensions can add up quick, so make sure you keep earning those neopoints! 10) This year, I will defeat ______ in the Battle Dome! I’m not much of a Battledomer myself, but my neofriends inform me that there is nothing more satisfying than defeating an opponent whom you have previously lost to many times. So go ahead and try it! Train up a bit, and you’ll go far. Perhaps you might even earn a Defenders of Neopia trophy. Practicality: When you get so far, you might be able to beat every challenger, but don’t worry! You’ll just have to find yourself another pet to battle who’s just as good as your pet. 11) This year, I will find and make __ new neofriend(s)! Friends are so important to have- and you can never have enough! So get out there and be friendly, be kind and be you, there’s bound to be tons of people who’d be thrilled to know you, and vice versa too! 12) This year, I’m going to be happy!!! This is, in my opinion, the absolute best resolution of any that you can make, because it could include all of the above, depending on you. Practicality: Well, if you’re a miserable old scrooge then this might not be a good one for you. Although, if you like being a miserable old scrooge, then technically you’re happy being miserable, so yay for you!! No matter which resolution you choose for yourself, here’s wishing you a very happy new year, and all the best of luck in keeping your resolution! 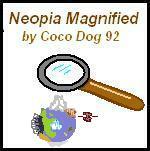 Neopia Magnified: Something has Happened! "We could put a star at the top of the tree," suggested Emily. "We'd have to buy one, though." That wasn't what I had in mind.